Stacey Gustafson’s Book ARE YOU KIDDING ME? If you are familiar with Stacey Gustafson’s humorous writing or have bought her book on Amazon, she would benefit from reviews made specifically tomorrow, September 8th, in the morning. ARE YOU KIDDING ME? is available in paperback and on Kindle. Her short stories have appeared in seven books in the NOT YOUR MOTHER’S BOOK series, in CHICKEN SOUP FOR THE SOUL, and various other publications. She was Erma Bombeck’s Humor Writer of the month. 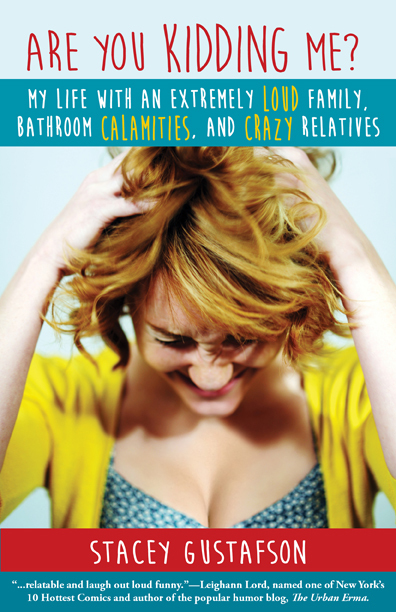 Readers can identify and laugh about everyday events in Stacey’s life. I’ve read most of her stories and each time, I enjoy her humor.